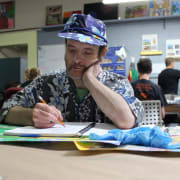 The Arts of Life advances the creative arts community by providing artists with intellectual and developmental disabilities a collective space to expand their practice and strengthen their leadership. We are currently seeking Artist Mentors to assist and collaborate with our artists in the pursuit and development of their creative practices. This unpaid volunteer position is vital to our community and is an exciting opportunity to be part of a vibrant, creative group of adult artists. Empowering our artists is an important part of The Arts of Life model. You will partner with studio staff to share your specific skill-set and technical expertise with the artists in the studio. Directly supervise and collaborate with assigned artists, including, but not limited to the following: helping artists to implement their goals, assisting artists with taking out and putting away supplies for their projects, providing technical assistance related to their projects, assisting studio staff with transportation. You may also be asked to assist in stretching canvas and matting, framing, and hanging work. Solve problem solve and work with minimal supervision. Work in a spirit of mutual cooperation. Show initiative, dedication, and creativity.